Colorful Peppers, Stuffed, Oriental Style, Thyme for Cooking one dish dinner. Stuffed Bell Peppers don't always have to have tomato sauce and cheese on them. Choose whatever color pepper you like. You could substitute Basmati or regular rice for the brown. Try to get 4-sided peppers, they are easier to stuff and lie flat. Cook rice in stock according to package directions, until done. Cut peppers in half the long way (try to find the best flat sides before cutting so that they will lay nicely) and remove stem end and seeds. Set aside (do not blanch). Peel and chop onion and garlic. Sauté onion, celery and garlic over medium heat in large skillet. Skillet must be large enough to hold all pepper halves, when they are stuffed, in one layer. When onions start to become translucent add ginger, water chestnuts and meat. Break meat up as it cooks. When meat is cooked add 1 tbs soy sauce and 1/4 cup chicken stock to skillet. Dissolve 1 tbs cornstarch in 1/4 cup chicken stock. Add to the skillet and stir well, cooking until it thickens. Add rice when rice is done, mix well. 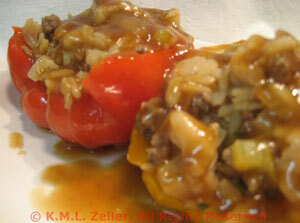 Fill peppers with meat and rice (set on a plate while you work). Once all peppers are filled using all of the beef and rice, put the peppers back into the same pan (filled side up, in one layer). Pour remaining 1 cup of chicken stock around peppers in skillet, cover, return to heat and simmer for 20 minutes, until peppers are tender. Dissolve remaining 1 tbs cornstarch in remaining 1 tbs soy sauce (add 1 tbs water to make it easier). Bring stock left in pan to a boil. Add cornstarch mixture and stir, cooking until thick. You have a sauce! Serve peppers with sauce on the side. Note: If you have any of the beef and rice left after filling peppers (as always, depends on size of peppers) just remove from skillet, keep it warm and serve on the side also. Note2: Use quick cooking rice - it will cook in the time it takes to sauté the meat. The rice I use takes about 15 minutes.